At the end of this week the embassy will welcome the visit of Yuli Edelstein, Minister of Public Diplomacy and Diaspora affairs, in Paris. During his visit Edelstein will meet with the Minister of Justice Michel Mercier, with the heads of the Jewish community of France and with the French media. 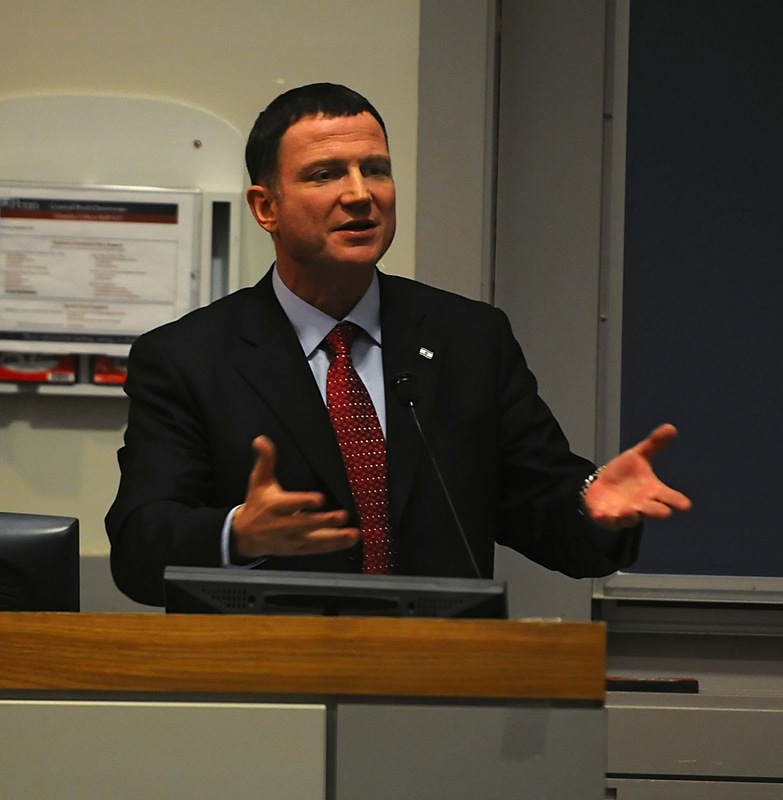 What is particularly interesting about Yuli Edelstein is his personal story. 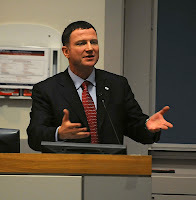 Yuli Edelstein was not born in Israel, he immigrated to Israel in 1987, after spending 3 years in Soviet Gulag. Why? Because he was a Zionist - a person who believes in the right of the Jewish people to live in their state in the Land of Israel. In 1978, as a fourth year student of foreign languages in Moscow, he applied for an exit visa. His request was denied. Mr. Edelstein joined the Refuseniks’ movement and became involved in Zionist activities - teaching Hebrew. He was arrested by the KGB on trumped up charges of illegal possession of drugs. After spending three years in the notorious Soviet Gulag, Yuli Edelstein was finally freed and, together with his family, immigrated to Israel. In 1995 together with Nathan Sharansky, Yuli Edelstein was one of the founders and leaders of Yisrael ba-Aliya, a new political party representing the new immigrants, mainly form Soviet Union and Ethiopia. In the 1996 elections and won an unprecedented success, becoming part of the government coalition. Between 1996 and 1999 Mr. Edelstein served as Minister of Immigrant Absorption, and from 1999 to 2001 MK Yuli Edelstein served as Deputy Speaker of the Knesset. After the elections of 2008 Edelstein was appointed to his present position - Minister of Public Diplomacy. Edelstein will also brief the diplomats on the current issues of the Public Diplomacy for Israel. Welcome to Paris! In 1988 I was 15 year-old student in high-school in the small city of Zhitomir, Western Ukraine. It was time when the citizens of the Soviet Union started to wake up from the complete passivity imposed on them by 70 year rule of the Communist Party. I will never forget these days, because there was something new in the air, something new and unfamiliar for all of us. It was not the feeling of freedom, no - it was the feeling of the promise of freedom. I remember how I walked to spontaneous meetings and gatherings, hold at the parks, in squares, on the streets, where people were listening to some courageous journalists and intellectuals who were talking about democracy. I remember the first semi-democratic elections for the Soviet parliament in 1988, when suddenly people get mobilized for the "anti-nomenclature" - non-communist - candidates. I remember how my mom, always afraid of KGB, went to spread the flyers for the only democratic candidate running in our city. I will never forget this. I have no doubt that people in Tunisia, Egypt, Libya, Yemen, Bahrain and Iran fell now the same way - the promise of freedom. Of course, Soviet Union is not Egypt or Iran, and Soviet block is not the Arab world. However, there is no doubt, in both cases we have popular revolution against regime that became dis-functional and repressive. Yes, it's about revolution. Is it a democratic revolution? nobody knows. We, or in effect, future generation/s will be able to judge. In fact, the precedents of popular democratic revolutions in the previous century show mixed evidence, with strong possibility of serious regression and anti-democratic counter-revolution. Want examples? In the last two months we could hear many experts and opinion-makers who compare the events in Tunisia, Egypt and Libya to the fall of the Berlin Wall in 1989 and the democratization process in the Central Europe. I think it's a wrong comparison. All of the new democracies in Central Europe were in the orbit of influence of the Soviet Union who suppressed with brutal force all the democratic movements - in Chechoslovakia, Hungary, Poland and others. Once the Soviet government showed "weakness" and its unwillingness to intervene militarily, these countries were set free. I think about more reasonable comparison, if any such comparison could be done, and this is the democratic process in the Soviet Union itself. In August 1991 the group of the communist leaders who opposed the democratic reforms of Gorbachev, organised a military putsch. After three days of the mass demonstrations in Moscow and the refusal of the army to suppress them, the communist regime was defeated. For 8 years Russia was struggling her way towards democracy, but this movement was seriously set back in the last 10 years. When Mikhail Gorbachov calls the political regime in Russia "imitation of democracy", one can understand that the democratic project in Russia was not a success story. And when you look at the other former republics of Soviet Union, with the exception of Baltic states, you can see that their journey to democracy is far from being accomplished. So, what happened? Lack of democratic tradition, economic problems and unsolved ethnic tensions created reactionary movement. The democratic system lost its value and was perceived as impotent to deal with social and economic disorder. In these conditions, the best organized group will always have advantage of coming to power and restoring the rule of strong leader that will dismiss most of the democratic achievements. By the way, the 1917 revolution in Russia developed in a similar way. In February 1917 the popular movement brought down the monarchy in Russia. However, this movement didn't have strong democratic leadership, and in the socio-economic chaos that followed the revolution it was the tiny Bolshevik party who seized the power. Despite its small size, Bolsheviks were able to mobilize resources, to gain support from within and from outside, and in 9 months organized perfect coup d'etat in Saint-Petersburg. It took them 4 bloody years of war to gradually take over all of the Russian Empire. And by the way, why limit this comparison to Russian history? Did French revolution of 1789 culminated in the complete victory of democracy? If I am not mistaken, there were months of revolutionary terror, and European campaigns of Emperor Napoleon I, and restoration... And the popular revolts of 1848, and the bloody suppression of 1871 rebellion in Paris... Couple of days ago I heard French historian who said that it took 100 years after the French revolution in 1789 to establish a true democracy in France. Which brings us back to the revolution in the Arab world. Please, don't have any illusions: it will take years to build democracy in the Middle East. Like in the Soviet Union, these countries lack democratic tradition, have deep economic problems and ethnic or tribal tensions. There are also anti-democratic forces, like Muslen Brotherhood, that happened to be organized better that the popular movements who created and fulfilled these revolutions. Of course, the risks are high and the future of the revolutions is not clear. However, we should not forget that people in the Arab world woke up , for the first time and against all odds. This movement is irreversible. It will take time, and probably generations, but the expansion of freedom is inevitable. “Strike 2.0” in Israel Foreign Service: another opportunity to upgrade Open Government? One month ago we have experienced in Israel something very unusual – the strike of the Israel Diplomatic service. Diplomats rarely go to strike, as diplomacy is considered an important element of the national security. But this time diplomats protested against the deterioration of their working conditions in the last 15 years, and there was a high level of mobilization among them. The diplomats felt that while praising their difficult work, the government did nothing to provide them with fair salaries. As much as unusual diplomats’ strike could be, after all it was a working dispute in the public sector, which happens often in Israel. Facebook page of the diplomats' strike' called "Save the Diplomatic Service"
However, what was really unusual, and in my eyes even amazing - both as a participant in this strike and the firm believer in Gov 2.0 - was the use of social media by diplomats in order to mobilize public support for our struggle. The public and media support were essential for the success of this struggle, because diplomats didn’t have meaningful leverage on the government or the public: they can’t stop the functioning of the economy, or impact the everyday life of the ordinary citizens. The impact of diplomats’ strike is very limited and could happen only in the long term. That’s why the public support for their demand was so critical. It’s so popular, that more than 50% of the Foreign Ministry employees have their personal accounts in Facebook. That’s why when people started to ask questions about our strike, we started to answer them in Facebook. And then, somebody wrote in the discussion I took part: Why diplomats won’t open their support page on Facebook? I immediately sent this proposition to the strikers’ committee, and on the very next day the new page was already there. This page allowed us to have direct access to all the news related to the strike. It allowed us to explain why we think our struggle was just and why it’s not us, but the Ministry of Finance and the Prime Minister who were responsible for this situation. Diplomats showed in Internet their salary checks, explained conditions of their life abroad, and also diffused through Youtube videos that explained this point. The Facebook page also allowed citizens to come to our page and ask us questions and express their opinion on the strike. Diplomats also used the traditional media and many of us sent articles to the central newspapers where we explained why we have no other choice but to strike. We diffuse these articles in Facebook. We also participated in the two biggest internet forums in Israel: Y-net and Haaretz and made sure that our messages werepresent there as well. Our media action was only part of the effort. Many official visits to Israel or by Israeli ministers abroad were cancelled because of the strike. We of course diffused reports on these events with the help of social media. As a result of this outreach, the citizens started to express their understanding of our demand. The traditional media expressed its support as well. The Prime Minister’s office and the Ministry of Finance were hold responsible for this situation - and after 35 days of strike the government accepted most of our demands. What are my conclusions from this amazing social media encounter between the public and the public sector? First, many public servants are already using Facebook for their personal purposes. They get familiar with its logic and functions. Second, public sector employees can ask for public support when in need. And if the demands are seen as reasonable, the public support can become crucial. Third, in order to be convinced, citizens should get more understanding about the public sector. The public sector should be demystified, should become more open and transparent. An interesting analysis by Herbert Meyer on the democratic movement in the Arab world, comparison to the collapse of the Soviet Block, and recommendations for US Administration of how to act in this situation. The lid has finally blown off the pressure cooker in Cairo. And as the Director of National Intelligence is apparently just now starting to notice, there are a few more pressure cookers on the stove that are beginning to make odd noises. Alas, in the real world there is no rewind button. So while it's tempting to dwell on how ineptly the President and his team have coped with the unfolding revolution in Egypt -- and God knows it's fun, given the breathtaking combination of arrogance and stupidity this administration has displayed -- our nation's security requires that we focus on the future. Where are we now, in Egypt and more broadly in the Mideast? What is likely to happen next, and then down the road, in this volatile and vital region? How can we tip the odds in our favor? Managing a revolution is like leaping across a chasm; it's best to reach the other side in one hop. When the old regime falls and is immediately replaced by a popular new regime -- which is what happened in countries including Poland and Czechoslovakia at the end of the Cold War -- that country's future usually is stable. But when the old regime falls and isn't immediately replaced by a new regime capable of quickly forging a new political structure, that country's future is up for grabs. This is what happened in Russia in 1917, when in February the Czar was overthrown and replaced by Kerensky and his (fairly decent) Social Democrats, who then fumbled in the Duma and lost control in October to Lenin and his (murderous) Bolsheviks. In Egypt the House of Mubarak has collapsed, and the country's army is dutifully holding things together until a new political structure can be erected. So while the jubilation in Cairo's Tahrir Square is understandable, Egypt hasn't had a revolution. It's had half a revolution, which means the country's future is in play. In today's world of mass communication and social networking, the uprising in Egypt is likely to spread throughout the region. Indeed, the uprising in Egypt itself was triggered, at least in part, by the recent popular uprising in Tunisia. And now there may well be popular uprisings in Jordan, Yemen, Kuwait, Saudi Arabia and perhaps Iran. There could be popular uprisings in Lebanon, Syria, and even in Gaza and the West Bank. In short, we have suddenly entered one of those rare moments in history when the world is about to be remade. When you study history, it's the story of competing operating systems. We put the individual at the center of life, while separating church and state. We believe in property rights and the rule of law. Western civilization unleashes the entrepreneurial talents of its people, and it encourages intellectual curiosity. It's an endless struggle for equality among the races and the sexes. Is Western civilization perfect? Of course not; it's designed and operated by human beings, and we make horrific mistakes from time to time. But when all is said and done, Western civilization is history's most extraordinary accomplishment; it's the modern world. In just the last century, there were two efforts by other operating systems to knock us off. The first of these was fascism, which led to World War II. The second was communism, which led to the Cold War. the individual is subservient to this church-state combination -- without the option to opt out. Islam doesn't unleash the entrepreneurial talents of its people, and it discourages intellectual curiosity -- which is why there hasn't been a major scientific breakthrough from the Islamic world in a thousand years. There's one other striking feature of this operating system: it treats women as though they were property rather than people. Simply put, this operating system is incompatible with the modern world -- and that's the glitch. Because the most radical and determined leaders of Islam, like their fascist and communist predecessors, wish to impose their operating system on the entire world -- including us. All we Americans have ever wanted is to be left alone. We have no wish to impose our operating system on anyone else, and we won't allow anyone else to impose their operating system on us. This means that to avoid war, the world's various operating systems need not be the same as ours -- but they must be compatible with our operating system so we can live together peacefully. What President George W. Bush called the War on Terrorism, and what President Obama calls overseas contingency operations, isn't really an effort to impose our operating system on Islam. It's an effort to push Islam down the road toward the modern world so that we can live together peacefully. In effect, it's an effort to help Islam develop Version 2.0. Honorable people can disagree over whether we've gone about this in the best possible way. What's indisputable is that since 9-11 Islam's operating system has been pushed harder than it's ever been pushed before. In a sense, Version 1.0 is falling apart and the code for Version 2.0 is being written before our eyes -- in Iraq, for example, and now in Egypt and soon throughout the Mideast. Since this is their operating system, not ours, it isn't our business to impose our values on each line of code the Moslem world's new leaders may write. But it is our business -- indeed, our survival depends on it -- to assure that whatever new version of Islam emerges is compatible with Western civilizationand willing to live with us in peace. This is really what "the war" is all about. It's true that history never repeats itself. But human nature doesn't change, so historical patterns repeat themselves all the time. For instance, in western Europe during the 1920s and 1930s the communists worked underground to take power in Italy, Germany, France and elsewhere. When World War II erupted, the Soviet Union itself and also these underground communists formed an uneasy alliance with the Allies to defeat our common enemy, the Fascists. When the war ended, both the Soviet Union and its communist supporters in western Europe turned back to the business of revolution through covert operations and, more importantly, through overt political activity. And western Europe was up for grabs. All we wanted was for western Europe to get back on its feet. President Truman and his great Secretary of State, Dean Acheson, understood that for these countries to find their way forward the communists had to be stopped at all costs. What we said to the western Europeans was, in effect, you're on your own and best of luck -- but for our own security we're not letting the commies play in your sandbox. If you don't like our meddling in your politics, too bad. Work with us, and the sooner we stop the communists the sooner we'll get out of your sandbox. While most people today think of the Cold War as a nuclear struggle between the Free World and the Soviet Union -- and indeed it was -- the Cold War was also a 45-year ideological struggle for the hearts and minds of western Europe's citizens. From the Truman administration through the Reagan administration, we fought this ideological battle at the political level and the diplomatic level. We fought it at the intellectual level, for example at conferences, in leading publications read by European opinion makers, at swishy embassy dinner parties and over endless cups of espresso with university students in cheap cafes across the continent. At the CIA we fought it out with the bad guys at 3am in the back alleys of cities like Rome, Paris and Berlin. It was hard going all the way, with more blunders and setbacks than any of us who were involved care to remember. But in the end, western Europeans themselves rejected communism, the Soviet Union collapsed -- and we'd won. Just as we kept the communists from hijacking western Europe, we now must keep the radical Islamists from hijacking the Mideast. To be precise, we've got to stop the Muslim Brotherhood from getting power, in Egypt or in any other country that will come into play. This is the great battle that lies before us, and we've got to fight it out in every way -- militarily, diplomatically, intellectually, and covertly. Among other things, we're going to need a first-class intelligence service. And while launching covert actions will be part of its job, its most crucial (and most under-rated) responsibility will be to provide our nation's leaders with an accurate picture of what's going on right now in the Mideast and what's likely to happen next. Who are the key players, and what are their strengths and weaknesses? In each country, whose side will the generals be on when unrest threatens the incumbent regime? First, I see that you've just established a 35-person task force to project likely developments in the Mideast. Better late than never. But if I were you, I'dreach out -- fast -- to really smart people with proven track records of accurately projecting that region's future. Walid Phares comes to mind, and if you haven't already read his brilliant essays at American Thinker or watched the interviews he's given on EWTN -- yes, EWTN -- then do it. 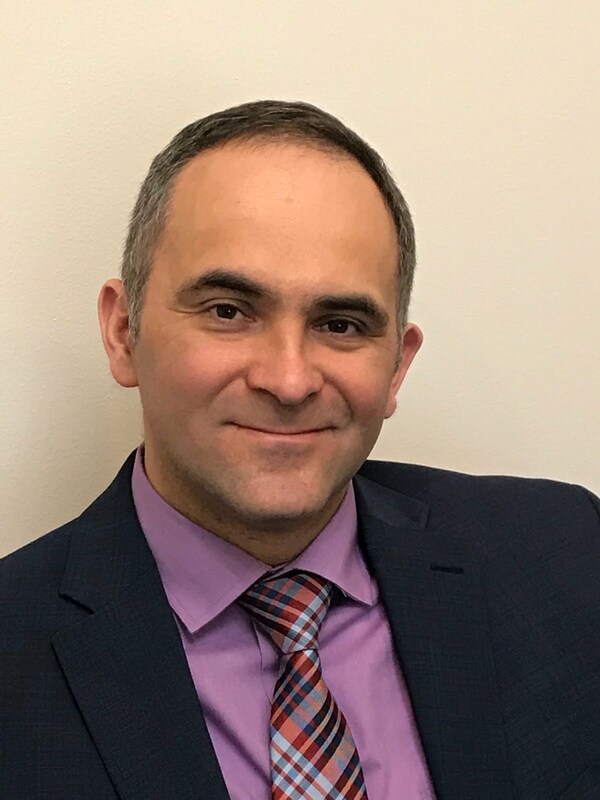 Read the remarkably insightful essays that Fouad Ajami has published in The Wall Street Journal, then call this distinguished scholar and invite him in for lunch. Get in touch with Michael Ledeen over at the Foundation for Defense of Democracies; he knows more about what's going on in Iran than all the rest of us combined, and he has a habit of being proved right. And when you meet with these gentlemen, ask them who else to talk with and to read. Remember, as intelligence analysts your job isn't to know everything; your job is to identify the people who know what the President and his team need to know, and then to pull it all together into a form that policy makers can absorb and turn into action. If they can see the future coming at us, soon enough and clearly enough, they can change the future before it happens. That's why projecting the future is the overriding purpose of an intelligence service. Second, as you focus on the Muslim Brotherhood don't let yourselves get caught in one of those idiotic "hawks versus doves" arguments. You're all too young to remember this, but during the Cold War the CIA's analysts twisted themselves into pretzels arguing about the "split" between the Kremlin's so-called moderates and hard-liners. When something happened in the world -- anything, come to think of it -- my in-box would overflow with papers arguing whether it meant that the Politburo's hawks had gained power over the doves, or whether the Politburo's doves were now ascendant over its hawks. It was total nonsense. Any time you put three people in a room there's going to be a disagreement about something. Of course there were disagreements inside the Politburo -- and politics in the Soviet Union being a winner-take-all game, sometimes a member of the Politburo suddenly turned up as ambassador to Paraguay, or dead in an implausible auto crash. But these arguments were over strategy and tactics, not over the ultimate objective, which of course was the imposition of a Pax Sovietica on the world. Just like the communists before them, the Muslim Brotherhood's leaders may disagree about how to move forward. But there's no disagreement among them on where they want to go; namely, to impose an Islamic caliphate on the world. Back in the Cold War years a lot of our deep thinkers were convinced we'd lose. And we nearly did. But then, suddenly, three unlikely leaders stepped onto the world stage: a Polish pope, a woman prime minister, and an ex-actor from California. Together they threw the switch from playing defense to playing offense, and within a decade we'd won the Cold War. So don't let the pessimists get you down. And if you just can't bring yourself to believe we can defeat the Islamists and win this global struggle, stop by my office and I'll let you touch my piece of the Berlin Wall. Herbert E. Meyer served during the Reagan Administration as Special Assistant to the Director of Central Intelligence and Vice Chairman of the CIA's National Intelligence Council. He is the author of two new eBooks, How to Analyze Information and The Cure for Poverty.